Charleen Caabay officially opened up her doors to welcome friends new and old into her new restaurant Kainbigan in East Oakland on Sept. 14. 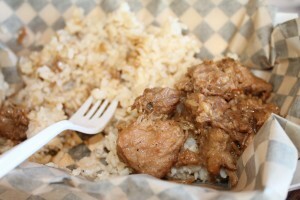 Kainbigan Restaurant (14th Avenue, 510-842-6315, kainbigan@gmail.com, Kainbigan.com) softly launched Aug. 19, but now the restaurant is in full swing serving up homemade Filipino comfort food inspired by Charleen’s mother and her late grandmother. “Where there’s food, there’s always good company and friends,” says Charleen, a 34-year-old queer woman who is the chef and owner of Kainbigan. Lines have been out the door of the small eatery and orders have been pouring in to the take-out restaurant since it opened. 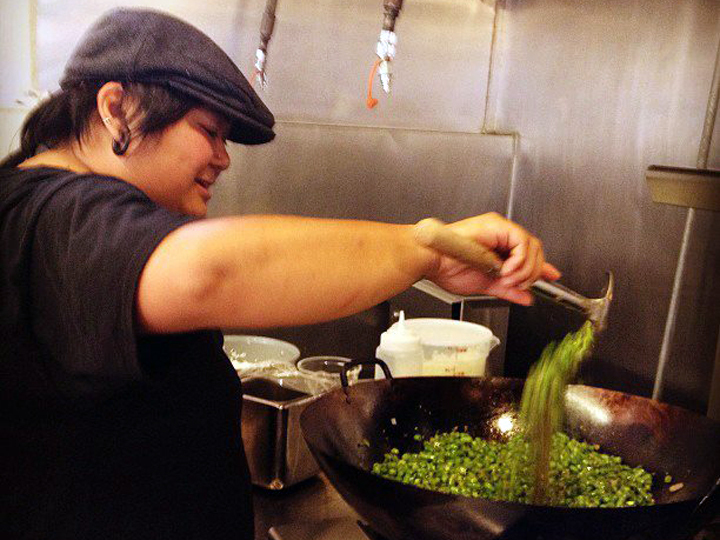 She never dreamed that she could be a chef and own her own restaurant. Charleen still can’t believe that she has a place where her friends can come and enjoy her homemade Filipino comfort food. There was always a gathering around the kitchen and table growing up with her mother and grandmother in New Jersey. Charleen lost that when her parents moved her sister and her to Vallejo when she was 13-years old. That same year, her beloved grandmother passed away. “I was very, very close to her because she pretty much raised me when I was younger while my mom worked all day,” says Charleen. To make up for the loss of the family feasts, her parents made new friends and invited them over to dinner all of the time, says Charleen. She continued that tradition with her friends in high school raiding their family’s pantries and cooking and grilling for everyone while all of their parents were at work. Discovering her love for cooking, the second-generation Filipina also missed her grandmother’s cooking and started to become aware of the loss of cultural foods among American Filipinos, she says. She lost many of her grandmother’s recipes, but she began creating her own and making healthier versions of the traditional Filipino dishes without losing the flavor. She also discovered non-Filipinos’ interest in Filipino food, while serving her food out at lesbian bars and nightclubs and on Oakland’s street corners. It’s been a long journey to opening the restaurant. The former IT expert started serving up her food at local women’s nightclubs and on street corners several years ago. At that time it didn’t even occur to her that she could make a living doing what she loves doing: cooking. As more people asked her if she catered, she started saying yes. It became a side gig for her until she was laid off from her dream IT job during the economic downturn. Suddenly, she found herself in a position deciding to go for it or continue the cycle of contract IT jobs that never landed her permanently at a company. To test things out, Charleen tapped into local entrepreneur resources for low-income women learning how to run a business and opened a pop up restaurant in Oakland for three months in 2012. During that time she kept driving buy the space in East Oakland with the, “For Rent,” sign on it, that a friend pointed out to her. The space located on the corner next to a barber shop at 14th Avenue and East 21st Street has been a series of restaurants in the past, now it is home to Kainbigan. It took about nine months to open the restaurant, which she invested an estimated $60,000 through investors and small business loans. An estimated five part-time staff help Charleen while she cooks up breakfast, lunch and dinner six days a week served in the restaurant, take-out and catering. Kainbigan is already growing and currently hiring for all types of positions. “Everyone that walks in … they are super excited because now they have a place to get my food,” says Charleen, who has an inviting bubbly and cheerful personality. Kainbigan Restaurant is located at 2101 14th Avenue in Oakland. Open Monday through Sunday, 11 am. – 8 p.m. Call to place an order at 510-842-6315 or email kainbigan@gmail.com or check out the menu at Kainbigan.com. Find out what’s cooking at Kainbigan’s Facebook page. Posted September 28th, 2013 & filed under Travel.